You could go to war in these Danner Men's 55316 Tan Tanicus 8-Inch Coyote Military Style Work Boots - literally. They're made in a military style that's totally ready for combat, and that means you can do battle with anything your work day might possibly have in st ... (see full details) (see specifications) #DNN55316. You could go to war in these Danner Men's 55316 Tan Tanicus 8-Inch Coyote Military Style Work Boots - literally. They're made in a military style that's totally ready for combat, and that means you can do battle with anything your work day might possibly have in store for you. Moisture-wicking mesh lining surrounds your steps to keep your feet feeling cooler. The breathable mesh lining in the men's shoes releases heat, so that cooler air can flow inside. It's all part of the athletic design that keeps you stepping lighter, moving more easily, and doing everything you need to do. Lightweight polyurethane footbeds soften your steps with impact-resistant strength. Polyurethane is lighter than rubber, and it absorbs more force, so that every time you step, it soaks up shock when your feet hit the ground. Meanwhile, fiberglass shanks provide arch support. The supportive shanks follow the curves of your feet to give your steps stability and reinforcement. That prevents your muscles from feeling strained and tired at the end of the day. There's an extra layer of cushion in the midsoles of this tan footwear to keep your steps bouncier. The durable outsoles are made with a pentagonal lug pattern to give your feet gripping traction everywhere you go. That keeps your steps steadier, and that makes you a whole lot safer when you’ve moving, bending, pushing, shoving, and working. You can take on any situation when you’ve got on Danner Men's 55316 Tan Tanicus 8-Inch Coyote Military Style Combat Boots, and you can definitely handle whatever your work day might have planned for you. So order yourself a pair from the Working Person's Store today. 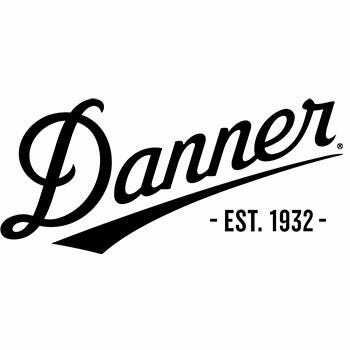 Danner Boots: Men's 55316 Tan 8-Inch Leather/Nylon Military Style Coyote Work Boots is being added to your cart.